[The Seattle Times] Russia’s attempt to reassert itself on the global aviation scene after a two-decade absence in the wake of the collapse of the Soviet Union, hit turbulence in the tragic crash of one of its Sukhoi SuperJets in Indonesia, even if it was pilot error. MOSCOW — President Vladimir Putin‘s ambition to revive Russia’s aerospace industry will hang on one question dominating the Sukhoi SuperJet crash probe in Indonesia this week: pilot or plane? Investigators have located the remains of the 90-seat Russian-built aircraft that crashed into a mountainside on Wednesday with 45 people on board. Salvage crews also located the flight recorder, which may offer vital clues to the cause of the crash, after the same jet had performed flawlessly on earlier flights piloted by an expert crew. “There’s a very good chance this crash wasn’t related to the design of the plane, but battling negative perceptions is very difficult,” said Richard Aboulafia, vice president of Teal Group in Fairfax, Va., an aviation-consulting company. At stake is Russia’s attempt to reassert itself on the global aviation scene after a two-decade absence after the collapse of the Soviet Union. The SuperJet, which carries about 100 passengers, was designed with Western partners and equipped with cutting-edge systems, as Russia seeks to win a slice of the regional jet market now…..
[Aviation Herald] This morning (Friday 11th May) search and rescue teams searching for the wreckage of a Russian built airliner on the slopes of Mount Salak finally reached the mountainous crash impact site and the wreckage below. The previous evening local police released some data stating that the rescue effort had engaged the services of over 1,300 personnel. Such a large force had been involved because of the sheer scale of the mountainous countryside in the area. Access to the site by air is just not possible due to the extreme terrain locally. It was taking up to 7 hours for the teams to climb the cliff face to reach the site of the incident. Four search and rescue teams were formed, the first an advance group of just 10 rescuers, the second consisted of 75 search and rescue experts. This was followed by a 3rd and 4th group which had a further 225 and 250 in the parties. Once the area above the impact site was reached, rescuers then had to use ropes to descend down the opposite steep cliff face to lower themselves to the wreckage below. The operation was suspended for the night after darkness fell. The aircraft with 36 passengers and 6 crew plus 2 Sukhoi executives on board was flying from Jakarta’s Halim Perdanakusuma Airport on a round demonstration flight. As it neared regions called Mount Salak and Bogor, about 40 miles south of Jakarta it vanished from radar and radio contact was lost. Indonesian air transport officials stated that the aircraft was flying at about 10,000 feet near Mount Salak at 3:30pm local time when the crew requested a descent to 6000 feet. Radar contact was lost as the aircraft descended in a right hand turn, at the previously requested height between Mount Salak and Mount Gede. Mount Salak is 2,211 meters (7254 feet) high, nearby Mount Gede is 2,958 meters (9,705 feet) high. 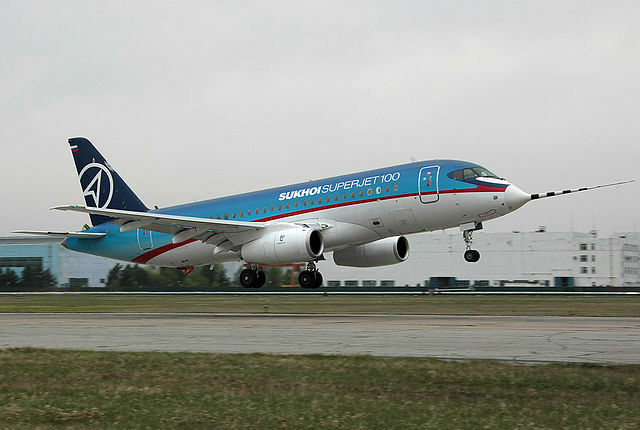 The Russian built Suhkoi Superjet 100 aircraft was on a promotional tour of Asia when it lost radio contact with local air traffic controllers in Western Indonesia earlier yesterday. The Sukhoi aircraft arrived in Jakarta on May 8th 2012, on the fourth stop of a six-nation “Welcome Asia!” road show after having already been to Myanmar, Pakistan and Kazakhstan. It was supposed to head next to Laos and Vietnam. 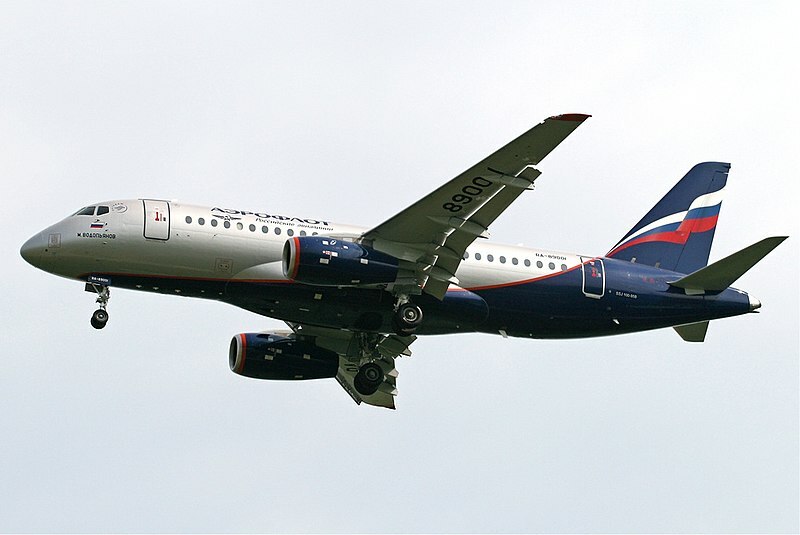 Sukhoi is Russia’s major aircraft holding company, employing more than 26,000 people. Read the original report and view large images at the Aviation Herald…. [Aviation Herald] – UPDATED STORY HERE…. Search and rescue teams using helicopters this morning, suspect that they have found the wreckage of a Russian built airliner on the slopes of Mount Salak, about 5,300 feet up the mountainside. Ground based rescue and recovery teams are currently on their way to the crash site. The first attempts to reach the crash site, including attempts to set rescuers down by helicopters had previously failed due to the extremely steep terrain. About 450 rescue personnel are currently moving towards the crash site by foot but had not reached the crash site before darkness fell. The rescue teams are currently only about 1km from the crash site. The coordinator of the rescue operation said that the aircraft “appeared relatively intact from the air” however it is clear that is has received substantial damage after leaving a trail away from the crater down the slope, there was no sign of survivors from the air. As rescuers have yet to reach the site the status of the occupants on board of the aircraft is still unknown. The rescue operation has been suspended for the night but will resume in the morning. The aircraft with 36 passengers and 6 crew plus 2 Sukhoi executives on board was flying from Jakarta’s Halim Perdanakusuma Airport on a round demonstration flight. As it neared regions called Mount Salak and Bogor, about 40 miles south of Jakarta it vanished from radar and radio contact was lost.Indonesian air transport officials stated that the aircraft was flying at about 10,000 feet near Mount Salak at 3:30pm local time when the crew requested a descent to 6000 feet. The request was granted by local air traffic control; this was the last contact that they had with the aircraft. Radar contact was lost as the aircraft descended in a right hand turn, at the previously requested height between Mount Salak and Mount Gede. Mount Salak is 2,211 meters (7254 feet) high, nearby Mount Gede is 2,958 meters (9,705 feet) high. See pictures taken near the scene and read the original report from the Aviation Herald…. 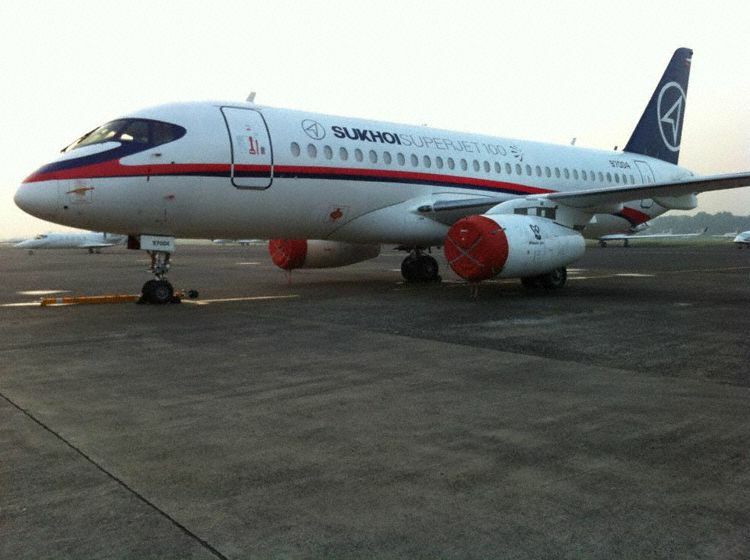 A Russian built Suhkoi Superjet 100 aircraft on a promotional tour of Asia lost radio contact with local air traffic controllers in Western Indonesia earlier today. The aircraft with 36 passengers and 6 crew plus 2 Sukhoi executives on board was flying from Jakarta’s Halim Perdanakusuma Airport on a round demonstration flight. As it neared regions called Mount Salak and Bogor, about 40 miles south of Jakarta it vanished from radar and radio contact was lost. Indonesian air transport officials stated that the aircraft was flying at about 10,000 feet near Mount Salak at 3:30pm local time when the crew requested a descent to 6000 feet. Search flights had been initiated in the area but were suspended after nightfall. On the ground a search team was deployed, and arrived after nightfall in the Mount Salak area. They will be joined by a second team in the morning at first light. Read the original report from the Aviation Herald…. [BBC News Magazine] Rarely a week passes without passport queue woes in the UK or tales of overzealous security staff in the US. So has going through an airport become a horrible experience? Airports were once an exciting window to the world. But with immigration services staff in the UK set to strike and passengers said to have waited for up to three hours for passport checks at Heathrow last week, for some the romance is over. Across the Atlantic, the American airport experience has also been generating ire. In April, a man stripped off in protest of the Transportation Security Administration (TSA) at Portland Airport and the father of a three-year-old boy was so enraged his son was patted down by an airport screenerin Chicago in 2010 he posted it on YouTube. The rules have changed since then, but earlier this year the TSA had to apologise to two elderly women in their 80s after acknowledging agents violated procedures. 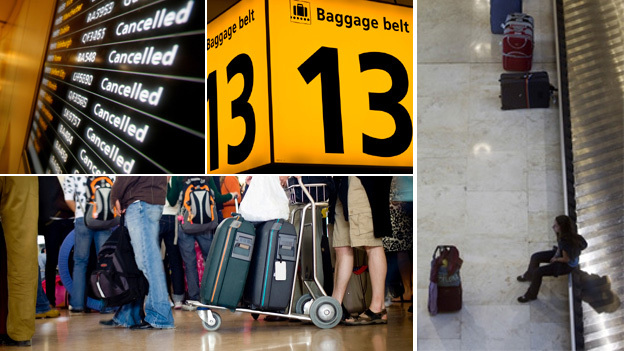 There are entire blogs dedicated to a whole array of airport gripes. Common complaints include confusing signs, chaotic carousel crowding, rampant profiteering, having to remove shoes at security, lack of free wi-fi and lack of information on delays and cancellations. So has going through an airport really become so terrible it has taken the thrill out of travelling – and if so how did it happen? 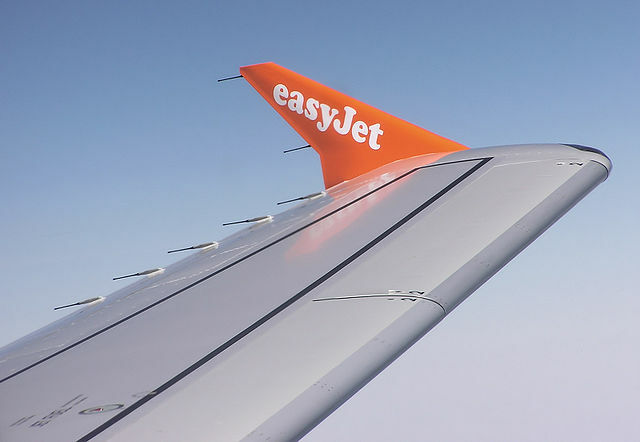 Mark Biwwa, 25, an online marketing professional from Malta, got so annoyed by a particularly bad experience at Luton Airport in 2011 he decided to immortalise it in a blog, Five Reasons Why I Hate Airports.